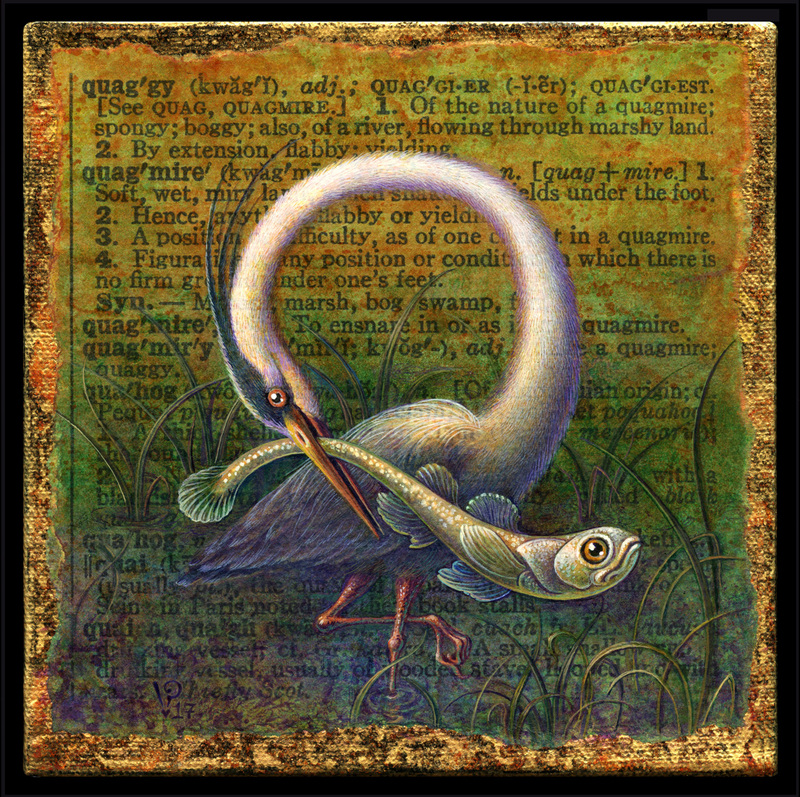 AWAD 2017 | Leah Palmer Preiss ~ Curious Art: Acrylic on text on canvas, 6" x 6"
True Confessions of a Bibliomaniac Acrylic on text on canvas, 6" x 6"
I’ll admit it, I’m a lifelong book addict. I love reading them, but I also love looking at them, touching them, talking about them, hoarding collecting them, & simply enjoying their beautiful & comforting presence all around me. So when Anu Garg offered “bibliomania” as one of this year’s words for A.Word.A.Day, I was ecstatic. I scanned the definition from one of my collection of vintage dictionaries. (Please don’t ask how many I have– it’s a fraught subject in this household!) 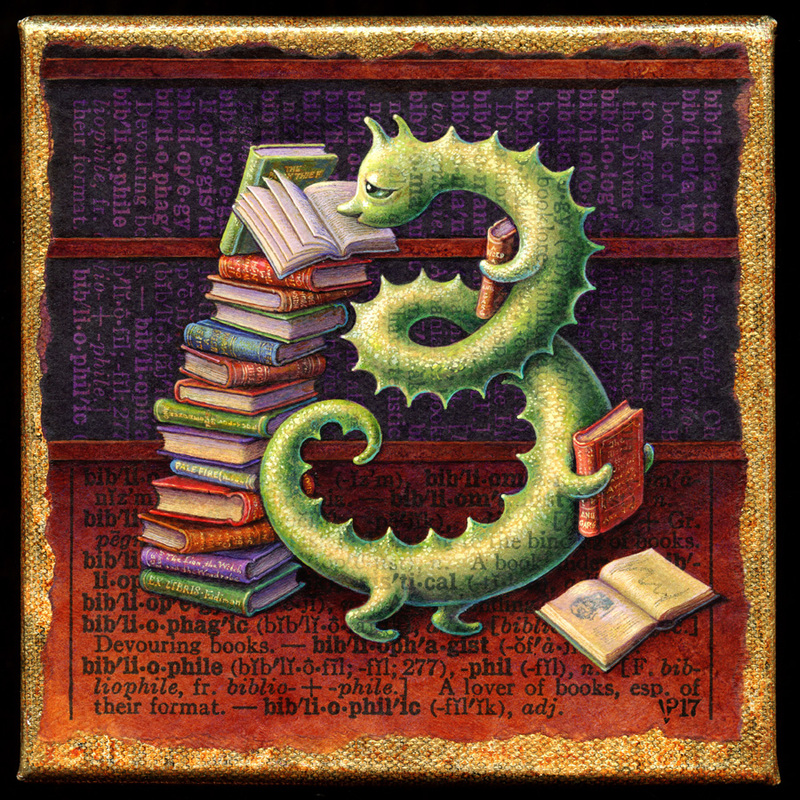 It took a little while to figure out how to illustrate the concept in the form of a letter “B,” but when I sketched out a twisted bookworm with a precipitous stack of books, I knew I was on my way. Here’s where the true confession comes in. (You thought it was the book-hoarding part, didn’t you? But that doesn’t embarrass me in the least!) My real transgression? I illustrated the wrong word! I’ve always said that I can’t see the forest for the lichen. 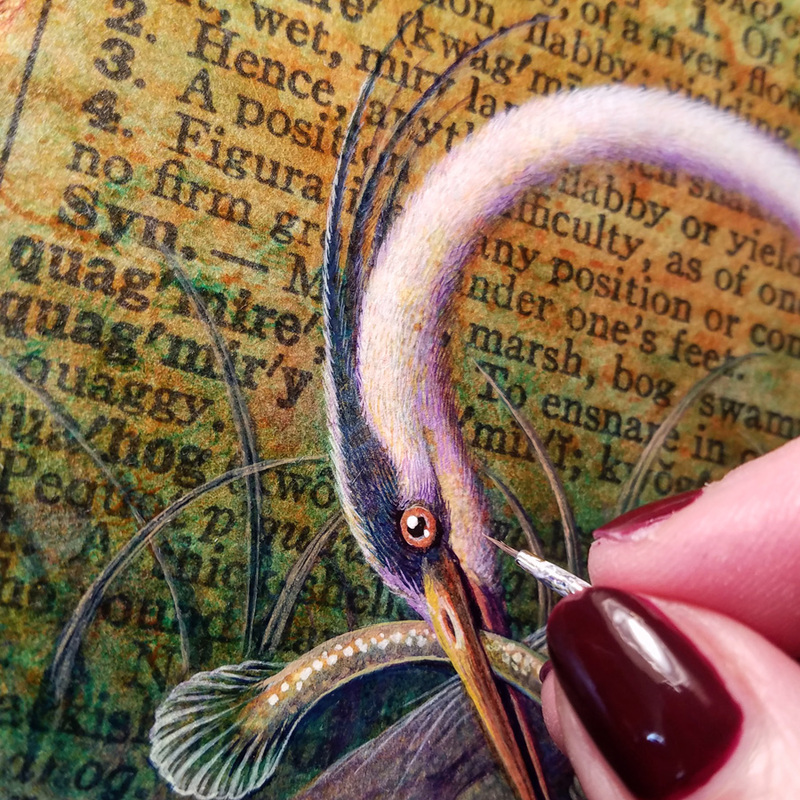 I may be meticulous in many ways, but alas, I’m very far from methodical, or I would have had the sense to double-check my word list before plunging ahead. Instead I obsessed for days over choosing the books for the stack & painting all the tiny titles. 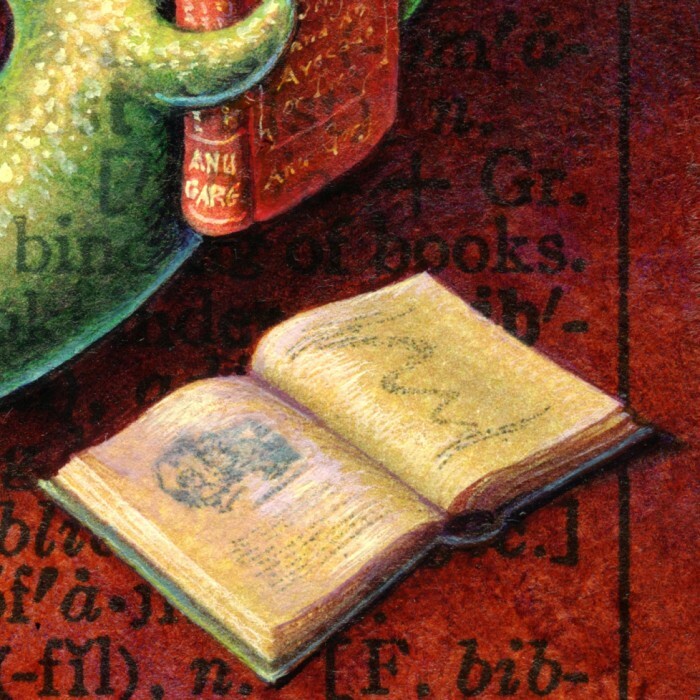 The worst part is that “bibliophile” is even involved in a sort of puzzle element hidden in the art (that’s a hint), so it’s not just the background that’s off-key…. 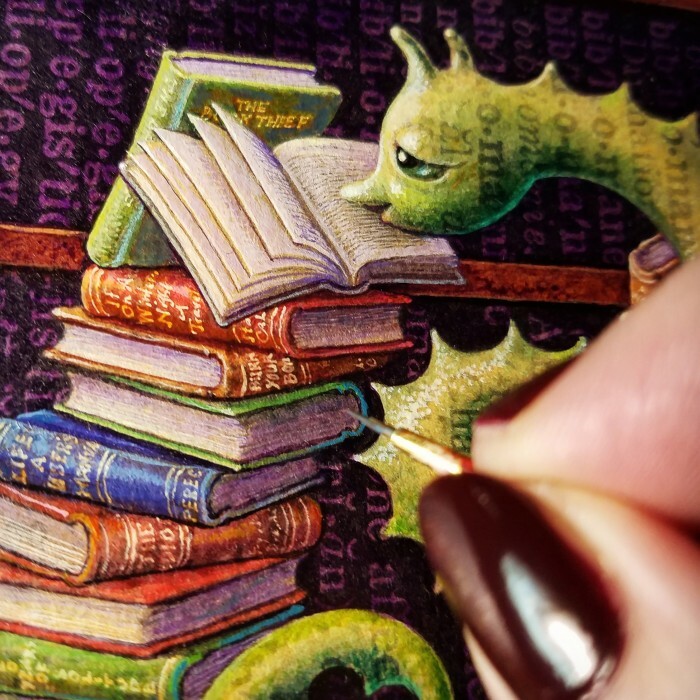 In any case, I hope you can forgive me for getting lost in the dark & disorienting forest that is my brain, & focus with me on the fascinating lichen of teeny tiny thumbnail-sized books! As for the books that the bookworm is clutching so fondly, many of Anu’s fans will recognize the titles, though I’ve taken some liberties with the cover designs to fit the old-school style. Thanks & apologies once again to Anu & all of my fellow bibliomaniacal logophiles! 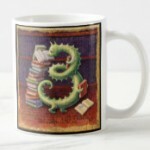 Update: This image is now available on mugs in my Zazzle shop! 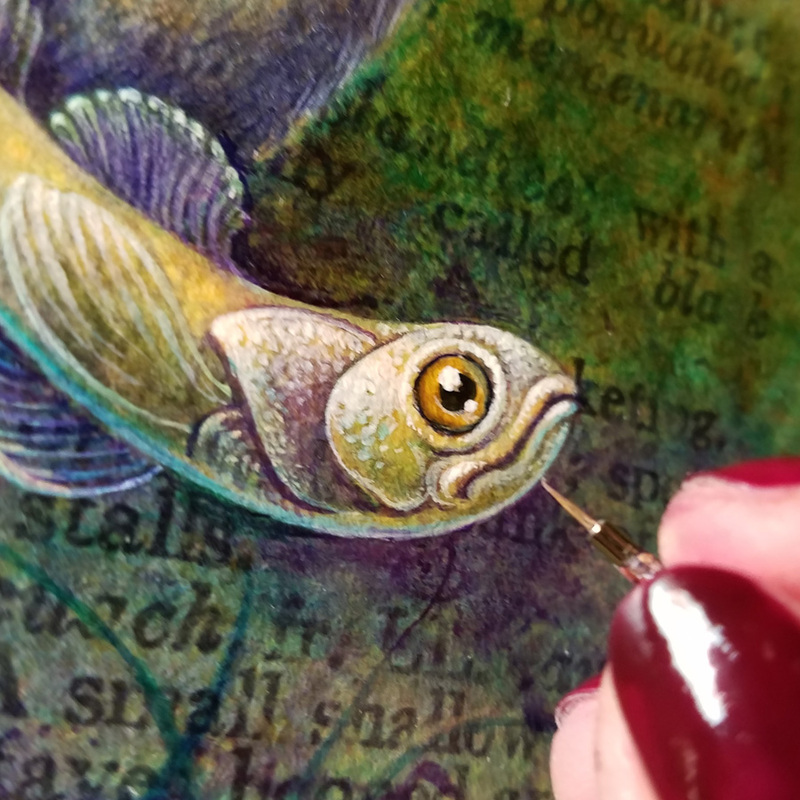 This entry was posted in A Word A Day Illustrations, Mugs Available, Paintings, Prints Available, Uncategorized and tagged A Word A Day, Acrylic, Alphabet, AWAD, AWAD 2017, Bibliomania, Bibliophile, Booklover, Bookworm, Letter B, Painting on 4December 2017 by Leah.